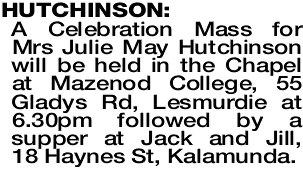 A Celebration Mass for Mrs Julie May Hutchinson will be held in the Chapel at Mazenod College, 55 Gladys Rd, Lesmurdie at 6.30pm followed by a supper at Jack and Jill, 18 Haynes St, Kalamunda. Passed away peacefully on 30.3.2019 at the age of 85 years. 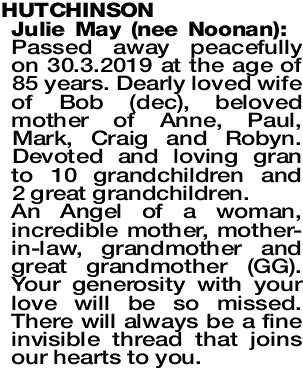 Dearly loved wife of Bob (dec), beloved mother of Anne, Paul, Mark, Craig and Robyn. Devoted and loving gran to 10 grandchildren and 2 great grandchildren. An Angel of a woman, incredible mother, mother- in-law, grandmother and great grandmother (GG). Your generosity with your love will be so missed. There will always be a fine invisible thread that joins our hearts to you. HUTCHINSON JULIE Fond memories of our daughter Gabrielle's loved mother-in-law who became our friend. 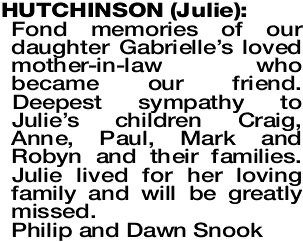 Deepest sympathy to Julie's children Craig, Anne, Paul, Mark and Robyn and their families. 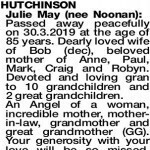 Julie lived for her loving family and will be greatly missed. HUTCHINSON JULIE The Oblate Community, Staff and Students of Mazenod College extend their heartfelt sympathy to the family of Julie. Our thoughts and prayers are with you all during this time of sorrow.